On a hectic Saturday before Christmas, writer Kate DiCamillo stands in front of a buzzing crowd of toddlers and children at the Red Balloon Bookshop in St. Paul, Minnesota. She is dressed in her usual black top and jeans, and her white-blond hair curls around her watchful face. Some of the kids sit cross-legged on the floor; some perch demurely on chairs or on a parent’s lap; some peer around the edges of bookshelves; some bat absently at furry puppets that hang from a display. DiCamillo is used to the pandemonium that is a crowd of children. She is not rattled. She keeps things moving. She reads a few pages from her new book, “Leroy Ninker Saddles Up,” and just as she is asking if anyone has any questions, one small rogue child suddenly shoots out of the pack, crawling fast, like Bart Simpson’s baby sister, circumnavigating the tiny island of space where DiCamillo stands, and then crawling off again. She watches him go and says, “I might have a question,” and everybody laughs. A boy raises his hand. “Why do books have words in them?” he asks. DiCamillo looks thoughtful. “That’s what you call an existential question, but I’m up for it,” she says. As far as DiCamillo is concerned, everything about books is magic, especially the fact that she is one of the people who makes a living by writing them. All 18 of her books, beginning with “Because of Winn-Dixie” in 2000, have been bestsellers or much lauded or deeply loved or all of those things. (Mostly, all of those things.) DiCamillo, this year’s Star Tribune Artist of the Year, won her second Newbery Medal in January for “Flora & Ulysses” ― something only five other authors have done in the award’s 93 years. She was also named National Ambassador for Young People’s Literature by the Library of Congress, a two-year appointment that takes her all over the country, speaking to children, educators and librarians about her favorite topic, reading. DiCamillo grew up in Clermont, Fla., moving there from Philadelphia at age 5 with her mother and older brother in hopes that warmer weather would improve her frail health. (She was hospitalized with pneumonia many times as a toddler.) Her father was supposed to join them, but he never did; she’s not sure why, and they are still estranged. Family life in Florida was just the three of them: mother, brother and Kate ― and their dog, always a dog. She graduated from the University of Florida with a degree in English and then sort of frittered away the next few years, working at the Circus World theme park and at a campground, thinking about writing, wanting to write, determined to be a writer, but not actually writing. In 1994, when she was 30, she tagged along with a friend to Minneapolis, a place she had never been. It was something of a risk. She didn’t have a job. She didn’t have a winter coat. (“I thought, how cold could it be? When it gets cold in Florida, you just run.”) But it turned out to be the best thing she could have done. “I could go 15 minutes in any direction and be at a bookstore or a library,” she said. She got a job at the Bookmen, a book warehouse and distribution center in Minneapolis. Her goal was not to become a full-time writer; she didn’t dare dream that big. She just hoped eventually to cut her hours at the Bookmen to 30 per week and make up the rest of her income through writing. And so she began to write, diligently, every day, two pages. And for a long time, she didn’t sell a thing. “Of my books?” DiCamillo asks. “Which of my books is my favorite?” The child nods. DiCamillo doesn’t answer the question right away. Instead, she asks if the girl has any siblings. Yes. She asks if the girl has brought a parent with her. Yes. So DiCamillo addresses the parent: “Which of your children is your favorite? Which one do you love the best?” And there is a little gasp. No, she doesn’t have a favorite, but she does has a special fondness for “Because of Winn-Dixie,” the book that started it all. It took a long time. Years. At first, she wrote short stories. Two pages a day, every day. She sent them to literary journals, and the literary journals sent them back. She kept writing. Years passed. And then the Bookmen assigned her to the third floor. Children’s books. Oh, my. She began to read. One day writer Louise Erdrich came into the Bookmen, and some of DiCamillo’s friends kind of pushed her forward, urging her to introduce herself. She remembers the moment vividly: Erdrich, she said, stopped and looked at her. “How long have you been writing?” Erdrich asked. “Four years,” DiCamillo said. The crowded bookstore is growing warm, and some of the smallest children are starting to rock and hum. Someone has asked DiCamillo about the Mercy Watson books, her series about a pig who loves buttered toast, and DiCamillo is explaining how those books came to be. “Can everybody hear me?” she asks. “Because this is fascinating.” And the humming drops and the children stop fidgeting and they listen. DiCamillo knows how to work a crowd of kids. DiCamillo never wonders if a word is too hard for kids. Instead, she wonders, “Is this the right word? How does it sound when you read it aloud?” And if the word sends a person to a dictionary, well, that’s part of the joy of reading. She began writing “Winn-Dixie” in the late 1990s, during a frigid Minnesota winter when she was missing Florida, her mother and her dog, Lucy, whom she had left behind. “The high was 37 below for three days in a row,” she said, hardly exaggerating at all. “I had this Florida car, and I’d open the car door and little pieces would fall off. They’d frozen to death.” Writing allowed her to immerse herself in the remembered warmth of home. She joined a writing group run by Jane Resh Thomas, the author of 14 books for children and a longtime teacher in MFA programs, including at Hamline University in St. Paul. “I was just shocked by the quality of her writing,” Thomas said. “I told her at the front door as she left, ‘You’re going to be famous, you know.’ And she said she had had so many rejections that she couldn’t believe in herself anymore. 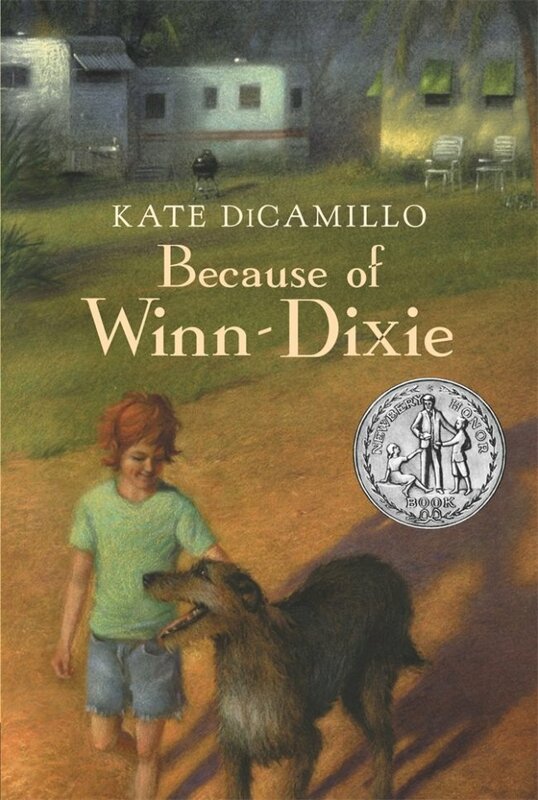 “Winn-Dixie” was published in 2000, six years after DiCamillo’s move north. It was named a Newbery Honor Book ― a runner-up to children’s literature’s top prize ― and won the Josette Frank Award and the Mark Twain Award and was made into a movie. The questions end, and DiCamillo signs books and poses for pictures. She is not much bigger than the kids she poses with, slender and tiny, almost elfin, but with a great booming happy laugh, a HA HA HA that everyone recognizes. Later, when she is up in the loft of the Red Balloon, signing books, she belts out a HA HA HA and people below look up and call, ”Kate!? Is that you? Kate!” And Kate peers over the edge of the loft and invites them up. Is that your dog? she says. Bring your dog up! And they do. Every morning, DiCamillo’s coffee maker clicks on at 5:30 a.m., and she comes downstairs, pours herself a cup of black coffee and carries it into her neat-as-a-pin office. She sits at a plain wooden kneehole desk that faces a blank wall, and she writes. Two pages. Every morning. No distractions. No excuses. Her discipline is legendary; her friends give her all kinds of grief about it. Her editor is happy to answer that one a few days later. “It’s spectacular,” she said emphatically.